Hello my lovelies! It's Saturday and there's a beautiful sun shining from my window. 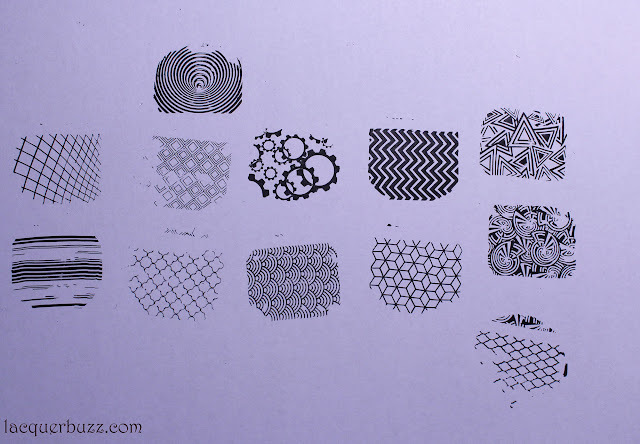 This week wasn't the best for me but I'm finally feeling better and I'm ready to talk about some stamping plates. 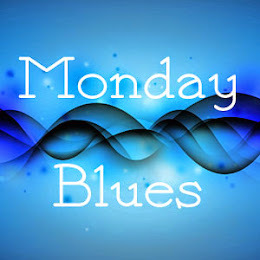 This is gonna be a long post with plenty of pictures, so get your cup of coffee or tea ready before your start reading. The Moyra stamping plates have been around for quite some months now, but because we're talking about a Hungarian company they aren't very easy to get ahold of. I know they are quite accessible for European people, but I'm not sure if it's the same for the rest of the world. The good news is that Nailland started selling them a few days ago and I'm pretty sure they ship internationally. There are currently 20 plates available, including the 4 new ones that just came out. I got mine from the local Moyra supplier and I picked 3 out of the ones that were in stock. The Moyra stamping plates are fairly large (14.5/9.5 cm), which makes them bigger compared to the Born Pretty Store and MoYou London plates I own. 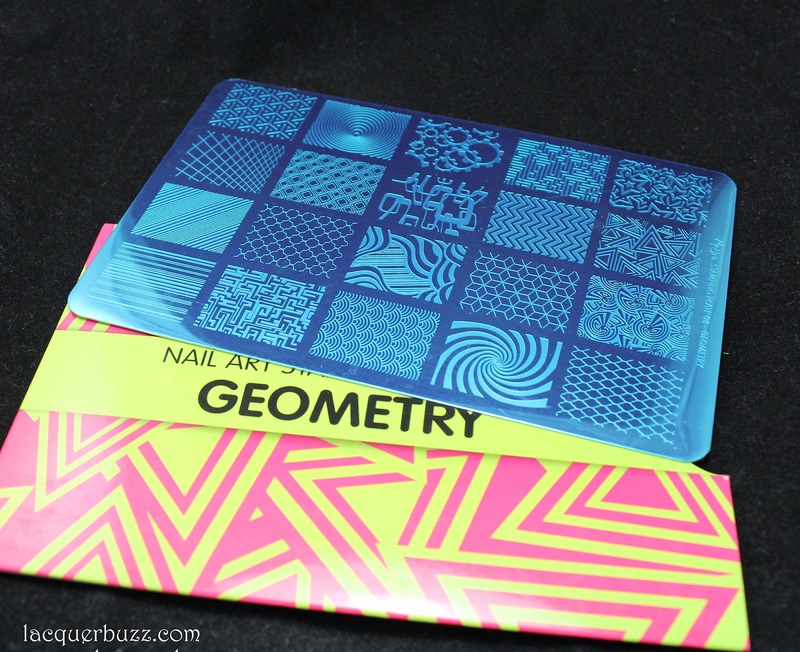 It's understandable though because the full nail designs are also a lot bigger (about 2 cm in length and 1.7 cm in width) and there are quite a few designs on each plate. 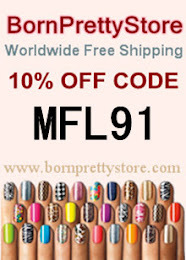 I find it great because the designs can fit wider nail beds and longer nails, so they are good for everyone. The plates come in a nice and sturdy cardboard sleeve and have the blue protective film on top. What I noticed about these plates is that they don't have a proper backing so they are very thin. They do have a Moyra sticker in the back but it's very thin, so it doesn't provide any protection, making the edge of the plates very sharp. I actually cut my finger trying to take out one of the plates from the sleeve. There's a warning about this on the packaging, but why not just solve the issue by adding some sort of thicker plastic backing to the plates? That being said, let's discuss each one of my plates individually. 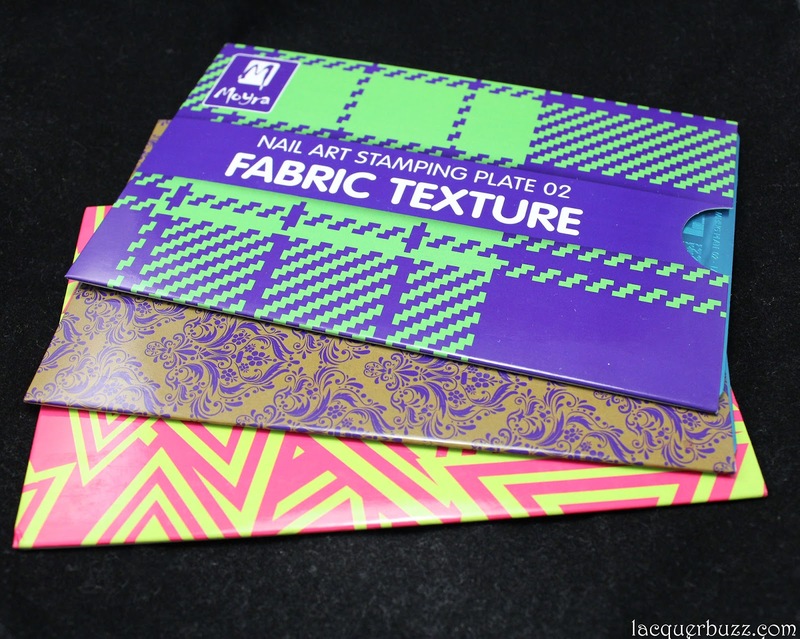 First off, we have plate 02, called Fabric Texture. 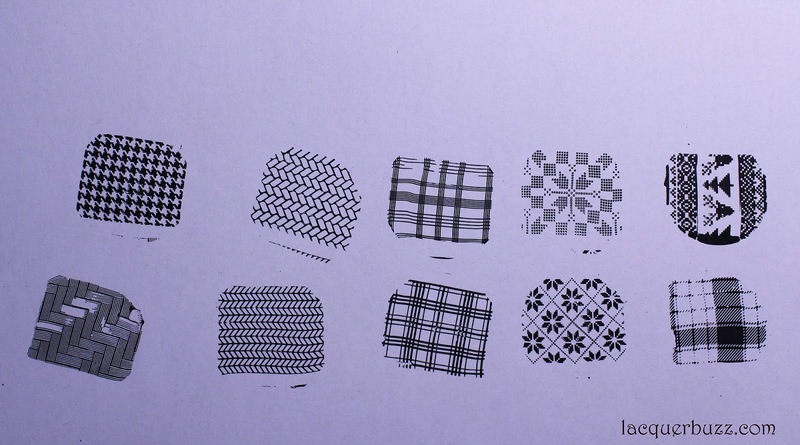 It has 20 full nail designs with geometrical and fabric patterns, like tartan, houndstooth, argyle and such. There are also some winter sweater patterns featuring snowflakes and reindeer. I'm a big fan of all those things on the nails, so I had to get my hands on this plate. I did some quick swatches for each plate on paper using my black stamping polish and clear jelly stamper from the Born Pretty Store. They were done in a hurry but can give you a general idea about how these images work. I didn't have major issues with any of the designs on this plate. Most of them work perfectly from the start and then there are a few that are made of very thin lines. For these ones you have to work fast so the polish doesn't dry out, since the lines are very very thin. You can see that there are a few bald spots in the design on the left but that is because I didn't work fast enough. I used this plate to stamp over Dance Legend Termo Trio 1. 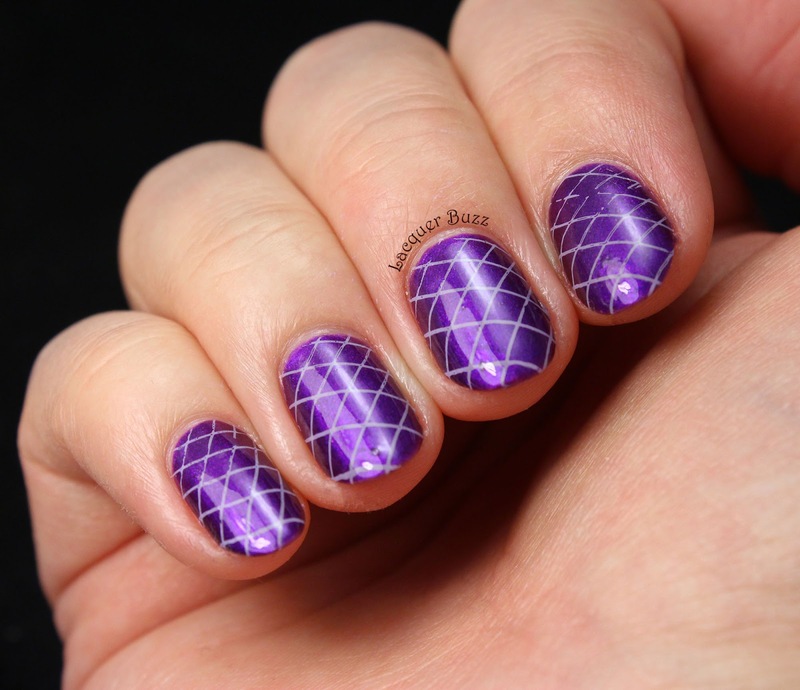 This design has fairly thin lines, yet I didn't have any issues stamping it. 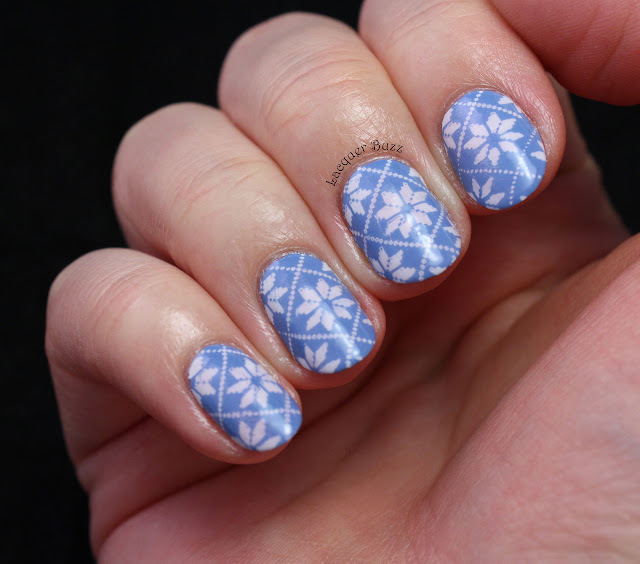 I also used the Fabric Texture plate to create last week's Monday Blues manicure that I called winter sweater. As you can see, it worked like a charm even with the white stamping polish I used. I'm very happy with this plate and can't wait to use it more in the future. Next up we have plate 08, also called Geometry. 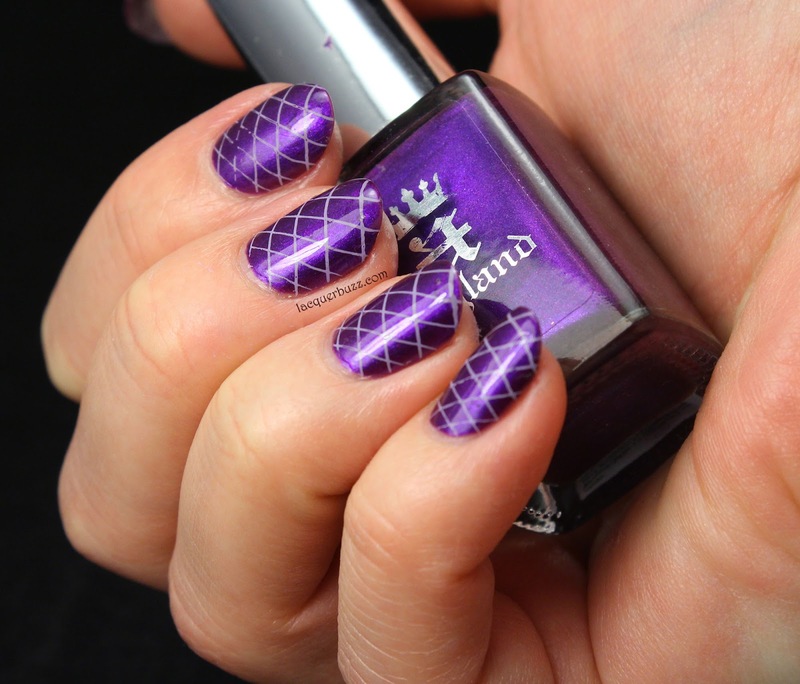 This one is also made of 20 full nail designs like chevrons, circles, lines and stars. There are a few "optical illusion" on it that are quite interesting. This one also has some very thin lines on it so let's see how it performed. I must admit that I had some issues with a few of the designs on this plate. Most of them work like a charm but there are a few that have extremely thin lines in them, like the quatrefoil one and the retro squares on the left. 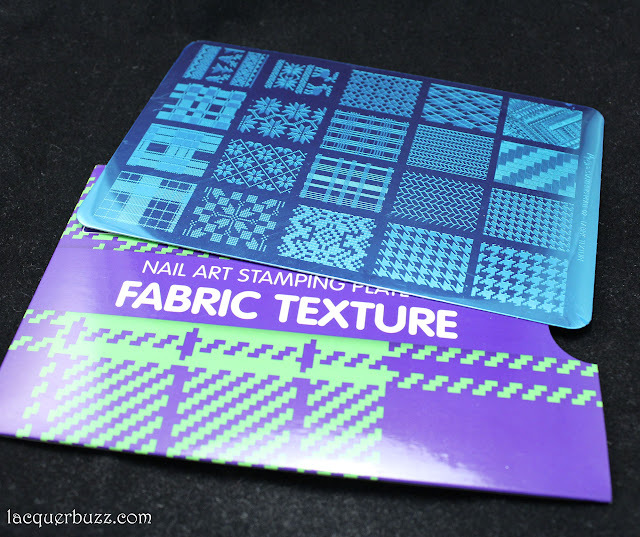 I'm sure that someone with good stamping skills can make them work but they will need speed, plus the best stamping polish and the best stamper possible. 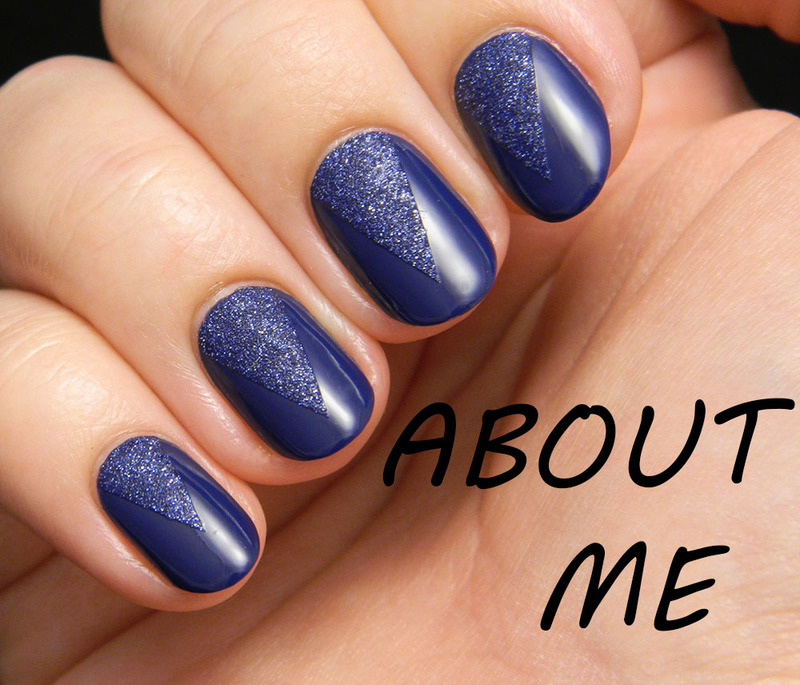 I used this plate to create a simple manicure that I haven't shown on the blog yet. The base polish for this was A-england Avalon. I used a lilac stamping polish from the Born Pretty Store to stamp one of the thin lined images and I'm very happy with how it came out. It isn't perfect but it's good considering it's a difficult design to stamp. Finally we have plate 11, called Damask Drapery, my absolute favorite of the ones I got. It contains 20 designs with all sorts of arabesque patterns. 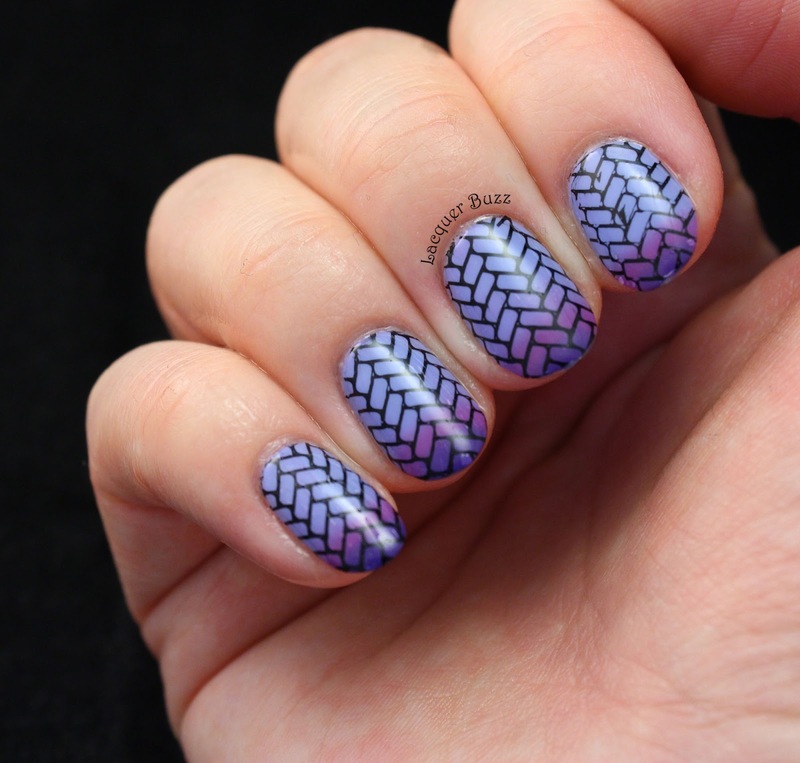 There's nothing I like more than stamping with intricate designs like these, so of course this plate was an absolute must for me. 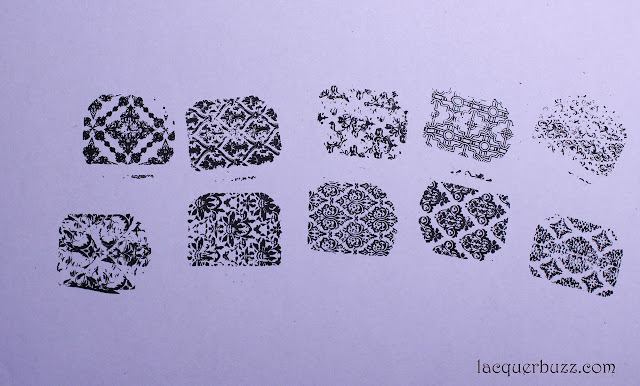 I know that the swatches above look kind of disappointing, but I chose to swatch the designs that looked more difficult to stamp. Some of them contain very thin and intricate lines, which makes them a little difficult to work with. I'm sure that by working fast they can be conquered as well. Keep in mind that I used a cheaper stamping polish to swatch these because I didn't want to use up my Konad black. They work a lot better when you use better quality stamping polish or a good metallic, like I did for the manicure below. 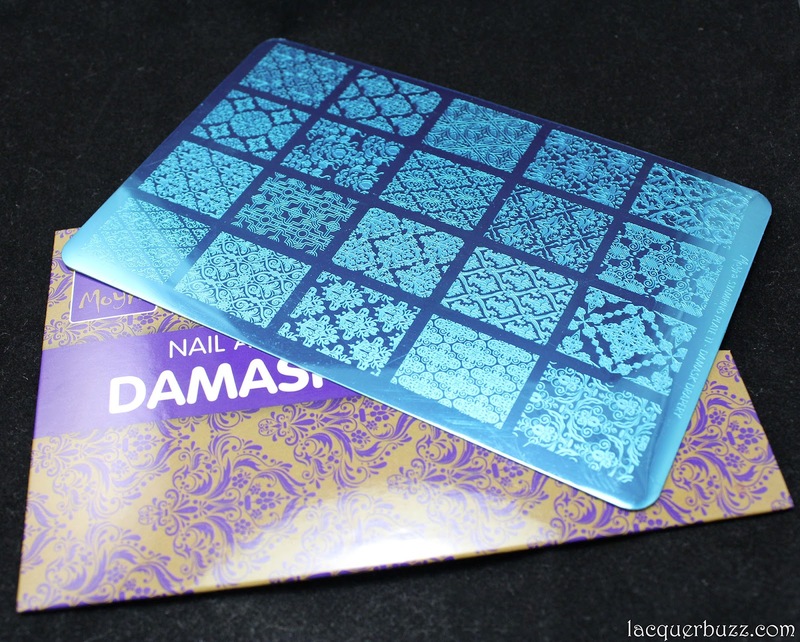 This was my Damask dream manicure that I showed you a few weeks ago. 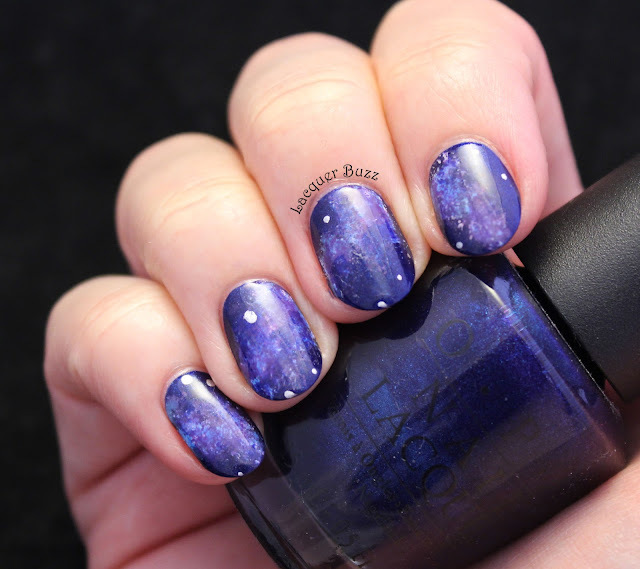 You can see here how amazing these images look if you stamp with a good metallic like China Glaze Passion. This truly remains my favorite Moyra plate and I'm sure I will use it tons in the future. All in all, I'm very happy with these plates and can't wait to get more. I highly recommend the Moyra plates because they have nice designs with a good size, they stamp well and are quite affordable. I really hope this review was useful for some of you and thank you all for reading! Have a fun and relaxing weekend!